Forwards in soccer, also called strikers, are recognized for their offensive role and scoring abilities. 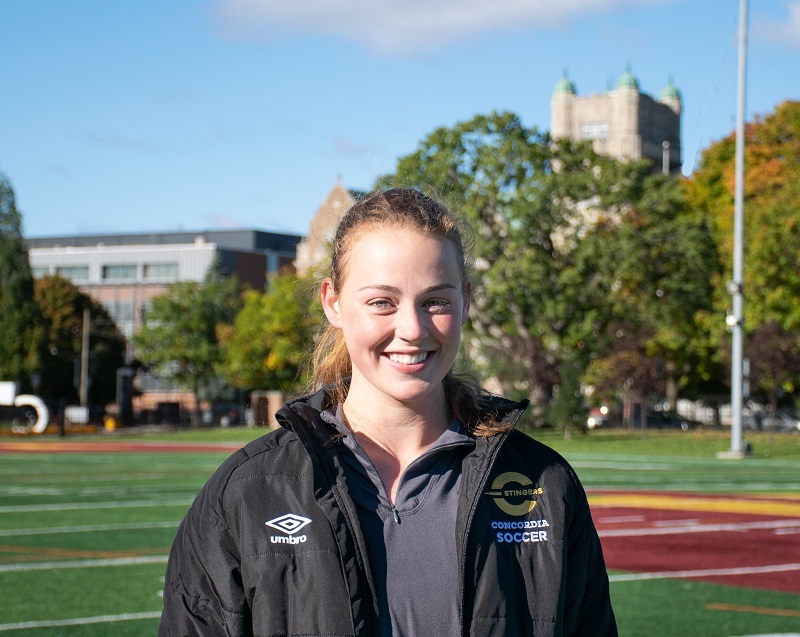 Sarah Humes is the striker with a great goal-scoring ability on the Concordia Stingers women’s soccer team. Head coach Greg Sutton said Humes is strong and fast. Photo by Gabe Chevalier. Midfielder-turned-forward, Humes is in her third year with the team. The Pointe-Claire native played 11 games in her first year with the Stingers as a midfielder, recording one goal. She explained how her coaches saw her in a more offensive role. In soccer, the term “typical nine” refers to the traditional striker of the team and is usually given to players in that position. That’s why, this year, Humes is wearing the number-nine shirt rather than the number 12 from the last two seasons. In 14 games last season, Humes scored five goals and finished in the top-10 scoring in the Réseau du sport étudiant du Québec (RSEQ). This season, the forward had five goals in 14 games, tied for most goals scored on the team. Humes scored five goals in each of the last two seasons. Photo by Hannah Ewen. According to the striker, being a student-athlete takes a lot of time and organization, but is something that ends up being beneficial. While going to practice is one of the many tasks she juggles, the forward said it’s the activity she enjoys the most. “We just had our last practice, and it’s a bit of a sad feeling to know that we won’t see each other every single day, but we know the year is not over,” Humes said on Oct. 18. The Stingers’s season finished Oct. 21. Sutton added that the Stingers are pleased with Humes’s dedication. The program hopes to gain more talented players that can help Humes improve her game. The Stingers concluded the 2018-19 RSEQ campaign with a 4-9-1 record, in sixth position in the league.